I hope everyone had a great Thanksgivin’ and hopefully you didn’t eat too much turkey. My family had a great Thanksgivin’ and, yes, I did overdo it just a bit. But it’s all good and I sure hope you got a chance to do some fishin’ over the weekend. The specks are startin’ to bite a little then the cold front came to town, and the wind was blowin’ like crazy, so it was a little tough to stay on the water. We had another cold front come into town this week so the fishin’ was a little tough for bass and specks. At times like that, you will have to find some areas of the lake that keep you out of the wind. The bass fishin’ wasn’t too bad on the Butler Chain after Thanksgivin’. I got a chance to fish with Rich Niles there and we caught and released 10 bass up to 3 lbs. each. Most of our bass were caught on plastic worms and slow-sinkin’ Senko-type baits. Rich did catch a couple of bass on a square bill crank-bait. The bass fishin’ on the Harris Chain has been hit or miss due to the wind and the weather. Try to find some areas out of the wind and fish the submerged hydrilla and pepper-grass beds. 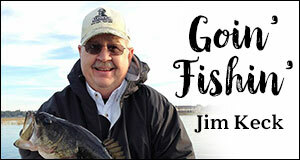 Try fishin’ with swim-jigs, swim-baits and speed worms. The bass fishin’ on the Kissimmee Chain has been good, especially last weekend. Our own John (J.R.) Ricketson and his fishin’ buddy Chip Dover won their tournament last Saturday. 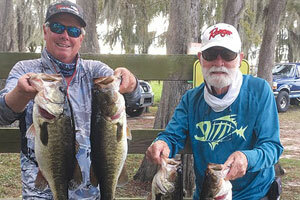 J.R. and Chip fished Lake Toho and caught five bass that weighed in at a total of 20.45 lbs. They also had a nice kicker bass that weighed a little over 6 lbs. There were 40 boats in the Central Florida Bass Hunters Tournament and they launched out of Lake Cypress. 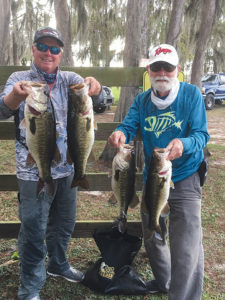 J.R. and Chip ran to West Lake Toho where they fished open water around the grass mats. They caught their bass on swim-jigs and plastic worms. J.R. wanted to pass on some information about the Kissimmee Chain just in case you wanted to fish the chain this week or over the weekend. The lake level in West Lake Toho is five feet higher than the other lakes in the chain, so you have plenty of water in West Lake to fish, but the lake levels in the other lakes are very low. You need to be very careful runnin’ the rest of the lakes due to low water. One of the teams that fished in the tournament hit something in the lake and it broke his prop. He had to get another prop brought to him so he could make it back to the weigh-in. Please be careful if you fish this chain this weekend. Hopefully, after the cold front this week the specks will start bitin’ a little better. If the wind doesn’t blow you off the lake, try fishin’ Lake Woodruff and Lake Monroe. You need to drift open water until you can locate the specks. Try fishin’ with jigs tipped with minners. Well, that’s it for this week. Stay warm and be careful on the water this weekend. Tip of the week: calm waters. Save a few and good luck!